*Savings of $0.25 per book with a maximum savings of $300. 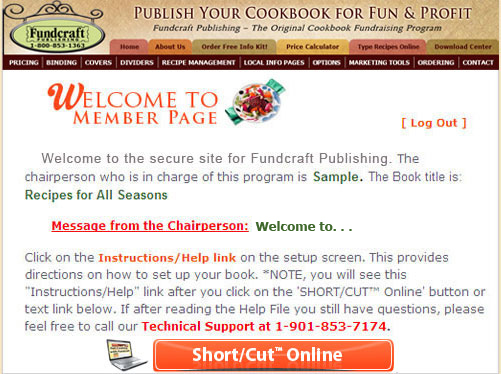 Every Fundcraft cookbook customer will be assigned a unique website location at www.fundcraft.com. A Web ID number and password will be given to the chairperson at the start of the cookbook program. If the chairperson decides to use Short/Cut™ Online (type recipes online - "you create your own cookbook"), they can log on with their secure password and customize the site for the group. *Normal Production Time = 45-60 working days for Fundcraft typed books and and 25-30 working days for short cut typed books.